The Houses of Parliament is made up of two Houses, the Commons and the Lords. These have been central to the UK's political system since 1512. Most of the current building was constructed during the Victorian era. 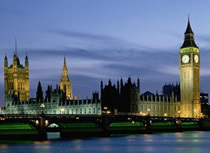 Tours can be arranged for UK nationals at any time of the year by contacting your local MP. For tourists, tours only run during the summer months, during the recess. There are many renowned sights attached to the complex, such as Westminster Hall, the only original part of Westminster Palace remaining today; Big Ben, the bell inside the clock tower which chimes every hour; the Central Lobby; the Parliamentary Archives, where records from up to 600 years ago are stored; and the Royal Gallery, the room that the Queen passes through at the State Opening of Parliament. During a tour visitors will given the chance to visit both Houses and the Queen's Robing Room. To take a Prague tour of the Houses of Parliament, join the queue outside.